Elephants are Thailand’s national symbol and Ayutthaya is home to many elephants that you can ride around the city’s sights. Mahouts (elephant keepers) will always be in town so you won’t be expected to direct the animals around yourself. If an elephant ride leaves you wanting more, visit one of the city’s elephant camps where you can get up close and personal with these inspiring animals. Late checkout of one room so you can shower and change before your transfer to the train station for the overnight 1st class sleeper train to Chiang Mai. Drive through the mountains scenery and the Golden Triangle to Chiang Rai, visit the Mae Fah Luang Garden or visit the Khun Kok Waterfall (Only 30kms (18 miles) south of Chiang Rai). It’s a great place. There is ample opportunity here for hiking and swimming. .
After immigration procedures, travel along the newly paved road for the 3 hour drive to Luang Namtha. En route visit the hill-tribe villages of Ban Laten, Kh'mu & Hmong. Free in the evening. Enjoy a one day gentle trek in the Nam Ha Protected Area through the minority villages. This trek takes you through the rice fields of Luang Namtha and into the forested foothills beyond. A reasonably gentle day's walk, the trail passes through the villages of Ban Don Kone, Ban Nam Hoi, Ban Piang Ngam and Ban Nam Ngean. As well as learning about the lifestyles of these different communities. An early morning rise to visit the local market where you can see the local villagers with their traditional dresses selling & trading their locally produced goods. After breakfast, visit the Yao villages and the Laos-China border check point (Pangthong), before driving through some dramatic landscape to Oudom Xai. Spend the afternoon learning about Paper making, learn how to cook the fibre, pulp it and make your own sheets of fibre. Continue the drive along stunning scenery and mountain back drops to Nong Khiaw. Nong Khiaw is a small rustic town by the bridge where the Route 1 to Sam Neua and Vietnam crosses the Ou River. This little settlement is blessed with probably the some of the most attractive natural settings in Northern Laos. Vertical limestone mountains with the river that runs through it takes the breath away. Nong Kiau Riverside stretches over 300 meters along the river only surrounded by forest and mountains. There are hardly any other sounds than the songs of hundreds of birds and cicadas. Embark on a long tail boat journey along the Nam-Ou & Mekong Rivers to Luang Prabang covering a distance of about 130km, passing the local villages and touching the real life of the villagers going about their everyday affairs of fishing, trading & washing along the rivers. Stop to visit the Pak Ou caves and observe the traditional production of rice wine distillation in Ban Sanghai. Arrive in Luang Prabang early evening and check into your hotel, where you can relax and enjoy the calm of this French colonial city. 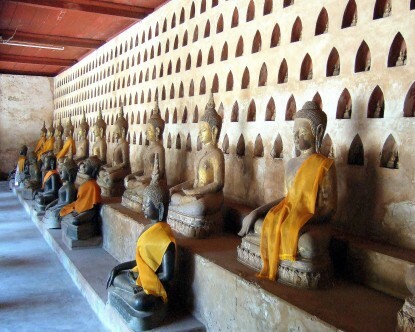 A half day excursion to see this World Heritage City and the former capital of Laos with its famous temples and their gleaming roofs, the royal palace, colonial architecture and its stunning mountain backdrop. Vang Vieng is one of the most picturesque little towns in Laos lies midway between Luang Prabang and Vientiane, making it an ideal stopover. Limestone karsts form a backdrop, as do the surrounding rice fields and a lovely river that flows through the valley. Tubing, caving and other fun outdoor activities are big draws of this town, which has emerged as a major stop on the tourist trail.